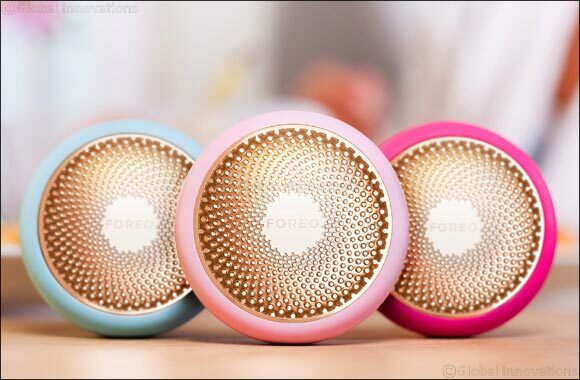 Dubai, UAE, March 14, 2018: Following an out of this world launch at CES in Las Vegas in January, the world’s most highly anticipated facial device from Swedish beauty powerhouse, FOREO, the UFO, has just landed in Europe and will be at Cosmoprof 2018 in Bologna to showcase itself to the rest of Europe, before landing soon in the Middle East. The FOREO UFO, (Ur Future Obsession) will be on display at booth number D3 - E4 at the B2B Cosmoprime Hall 19, giving retailers, buyers, potential partners, media and consumers the very first look at the newest way to mask. Hundreds will flock to the FOREO stand on day one to see for themselves the live demos and find out more about this new take on the traditional sheet mask, ahead of the global retail launch next month. Since news broke of the UFO, retailers and potential partners have jumped at the chance to partner with FOREO, developing custom made sheet masks that fit the device so consumers can use their favoured sheet masks with it. Cosmoprof is expected to bring some new collaborations to FOREO, really giving weight to the new way to mask and revolutionising the traditional sheet mask regime as we know it and creating a global phenomenon for the beauty industry. Speaking for FOREO, CEO Paul Peros mentioned it was important to showcase the UFO to Europe in this way to allow potential mask collaborators to see the opportunity first hand. “The UFO is a device like no other and it is quite simply a game changing product that the world hasn’t seen before. The device works like an orchestra. The technology acting as the conductor to activate the components of the mask like an orchestra would play, and bringing out the ingredients to provide a spa-level facial in only 90 seconds. We have been developing the technology for four years and to bring it to our retail partners and offer them the chance to collaborate is the new way to do business.” says Peros. The UFO combines LED light therapy with cryo-therapy, thermo-therapy and T-Sonic pulsations activated via a smartphone. It evenly distributes the mask essence across every area of the face, while various functions allow active ingredients to penetrate more deeply for superior results. Utilizes hyper-infusion technology, combining heating to open pores, T-Sonic™ pulsations to instantly infuse active ingredients more deeply into the skin and cryotherapy to seal the active ingredients and firm the skin. UFO Smart Masks are made from soft micro-fiber infused with plant and fruit extracts, concentrated botanical oils and natural flower water. Each mask is paired with a pre-programmed UFO treatment routine to boost their effects. There are two masks currently available at time of launch, with another five from the FOREO Skin Rehab Collection due to launch in April. The UFO can be paired with the FOREO app to get the most out of the device. While the ‘Make My Day’ and ‘Call It a Night’ masks are pre-programmed into the device, the FOREO app gives access to all future mask treatments. In addition, users can reorder masks with a simple click and unlock UFO's full potential by customizing the intensity of all UFO settings to perfectly suit individuals skincare needs.